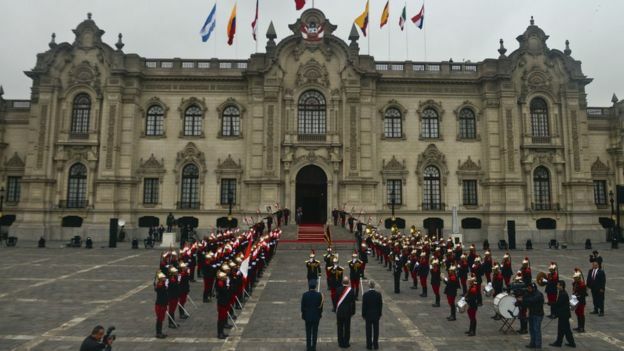 A 77-year-old former investment banker has been sworn in as Peru's new president at a ceremony in Lima. 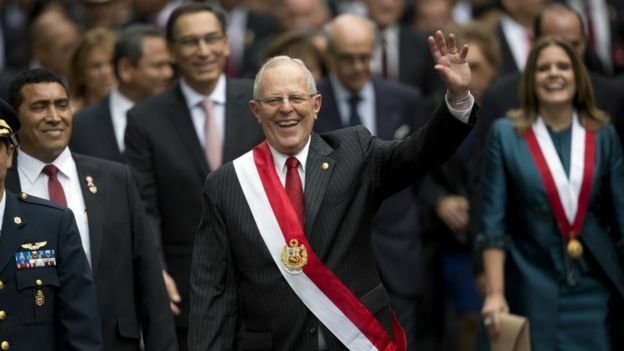 In his inaugural speech, Pedro Pablo Kuczynski - known as PPK - said he longed for Peru in five years "to be more modern, more just, more equal". The conservative beat Keiko Fujimori in run-off elections last month. Peru's economy has risen sharply in recent years fuelled by a commodities boom but many Peruvians live in poverty and lack basic services. Who is Peru's new leader? Mr Kuczynski has pledged to work for all Peruvians, calling for a "social revolution". He will need support from Ms Fujimori's party to enact reforms, however, since it controls congress. Ms Fujimori, the daughter of incarcerated ex-President Alberto Fujimori, was once favourite to win the vote but eventually lost by less than a quarter of a percentage point.